School gardens continue to grow at Limestone schools thanks to partnerships with community agencies such as Loving Spoonful. Limestone continues to expand its partnership with Loving Spoonful’s school-garden based GROW Project, teaching good food, community, and collaboration. Every year 660 elementary students in 25 Grade 4-8 classrooms plant, raise, and harvest a variety of fruits, vegetables, herbs and flowers, learning first-hand the processes and value of growing good food as a team in their own school garden. A series of six curriculum-connected classroom workshops complement their garden time, teaching students about food systems, social justice & food security, food & culture, healthy gardens, and food preparation. Culminating with a Salad Bar celebration, students experience the taste of freshly picked ingredients and the rewards of their collaborative efforts. GROW reaches beyond our classrooms to connect students with their community as students meet farmers and work with a community artist. An understanding of the needs of the community is built as schools donate some the food they grow to Loving Spoonful’s Grow a Row program. The fresh produce is then delivered to agencies and shelters across the city. 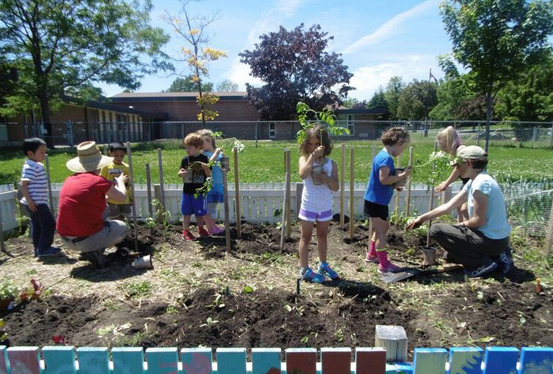 Thanks to funding from the Ontario Trillium Foundation, the GROW Project will be established at 21 elementary schools in KFL&A by the 2019-20 school year, bringing the total number of students reached to over 800 every year. Grade 11 IB students threw their Grade 12 counterparts a good luck party before exams.